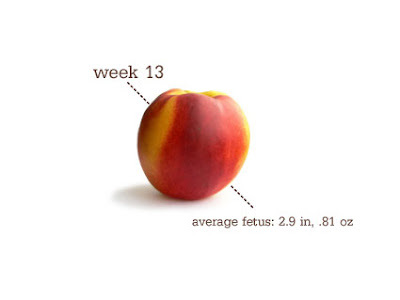 This week the baby is a Peach!! Yumm! I have been counting down the days to when I can say I'm in my second trimester. I'm there, baby!!! Woo hoo!! Things are supposed to start looking up from here! Belly is definitely firming and bulging a bit. Not enough for anyone to notice much except for hubbie and myself. I have a few pairs of pants that are uncomfortable to zip; which is impressive as I have lost quite a bit of weight and everything is running big on me in every way but my belly. Baby's progress front: forming teeth and vocal cords, baby is approaching the non-alien look by being a bit more proportional. The head only makes up 1/3 of the total size now which is appx 2.9 inches or .81 oz!! No more alien baby with the equal head to body ratio!! Also, the intestines have started moving into the body now that there is room and out of the umbilical cord!! Normality!